Garlic Butter Chicken Meal Prep with butternut squash and rice. Make this recipe ahead of time to enjoy throughout your busy week! A tasty meal that is flavorful, easy-to-make, and not boring. Meal prep recipes are for planning your meals ahead to have throughout the week already prepared. 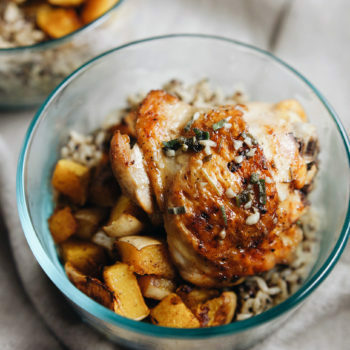 You can go in many different directions with meal preparation recipes – but today we are going with chicken, butternut squash, and rice. Healthy cooking that is tasty and not boring! For this recipe, I browned on both sides then roasted in the oven. You can either roast chicken without browning or bake on a sheet pan. Either store whole chicken pieces in your meal prep or slice before storing. I enjoy using chicken thighs because of how moist and flavorful they are. You can use either skinless or skin on chicken thighs or use chicken breasts for a leaner cut of meat. Add other roasted vegetables to your meal prep like: broccoli, cauliflower, brussels sprouts, or peppers. Serve with your favorite grain – either rice, quinoa, or ancient grains. Autumn Dijon Chicken Sheet Pan – Delicious honey dijon chicken with butternut squash and brussels sprouts, made on one pan, and takes only an hour! Healthy Moroccan Chickpea Stew – An easy 30 minute vegetarian meal. Serve with rice and enjoy as a flavorful meal prep recipe. 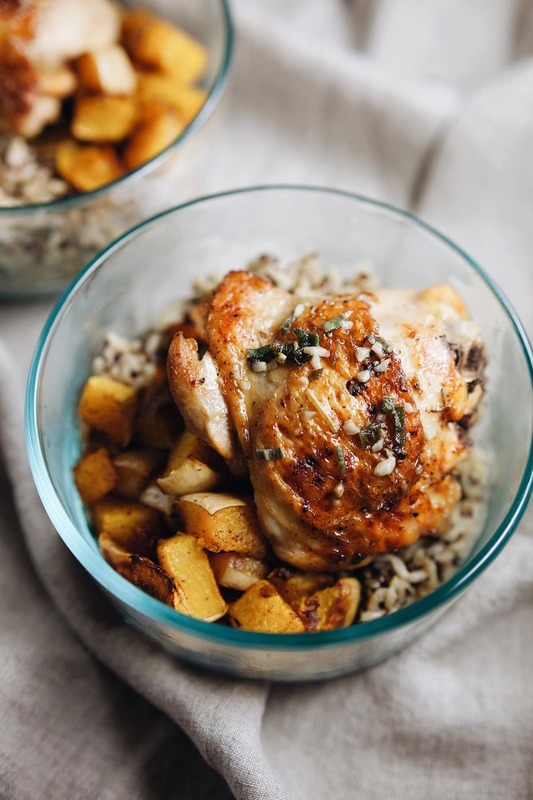 Lemon Roasted Chicken Thighs with Potatoes – Absolutely delicious roasted chicken with a flavorful lemon-y sauce. Serve with rice as an easy meal prep recipe. Preheat oven to 400F. Lay butternut squash cubes out on sheet pan, brush with olive oil. Sprinkle salt and cinnamon evenly over top and bake on lower shelf in oven for 25 minutes. Carefully flip squash half way with spatula to bake evenly. Chicken: Sprinkle a pinch of salt and pepper on both sides of chicken thighs. Heat a large cast-iron skillet on medium heat. Cook chicken in butter for 3-4 minutes on each side, until golden brown. 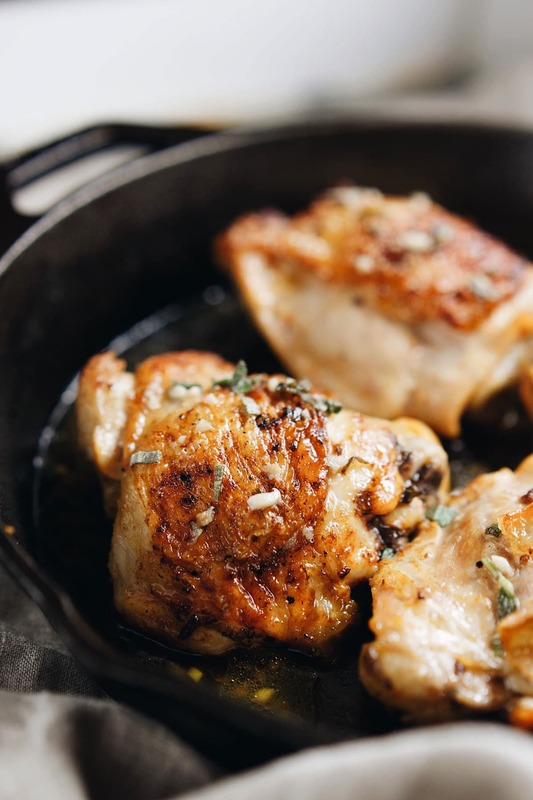 Remove chicken from pan, on low heat saute garlic for 1-2 minutes, stir constantly to avoid the garlic from burning. Add chicken broth to skillet and stir ingredients together. Place chicken skin side up into broth, use a spoon to baste chicken with sauce. Bake on top shelf in oven for 15 minutes, or until chicken is cooked through and has golden crispy skin. Remove butternut squash and chicken from oven. 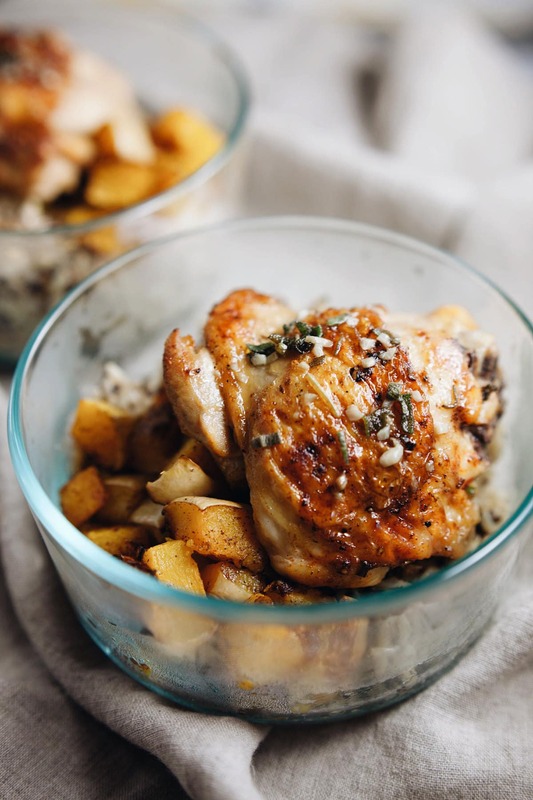 Baste chicken with garlic-butter and sage sauce. Serve/prep chicken & sauce over rice with butternut squash on the side. Add additional sides if desired. Serve with your favorite grain - either rice, quinoa, or ancient grains.